As of January 2016, much of the table below is obsolete This is mainly because the Playstation 4 and the Xbox One are compatible with very few wheels. What follows is a quick and dirty guide to the most relevant wheels currently on the market. The cheapest compatible wheel worth buying is the Thrustmaster T150. The best balance of price and performance are the Logitech G29 (basically a G27 with more buttons and a better brake pedal) and the Thrustmaster T300. The G29 is slightly cheaper, has more buttons and only requires a shifter for a full 3-pedal setup. The T300 has slightly better force feedback and has access to all of Thrustmaster's high-end accessories (Logitech pedals are compatible too, with a €10 adapter from Thrustmaster). Take your pick. Similar story as with the Playstation 4: your main choices are the Logitech G920 and the Thrustmaster TX. The G920 has fewer buttons than the G29 (but still more than a G27) but otherwise the differentiating points are the same. Not easily done, I'm afraid. Your only options are Fanatec's Clubsport V2 (extremely expensive) or buying one of the Thrustmaster wheels, plus the base of the other (e.g. : buy a T300 set + a TX base). 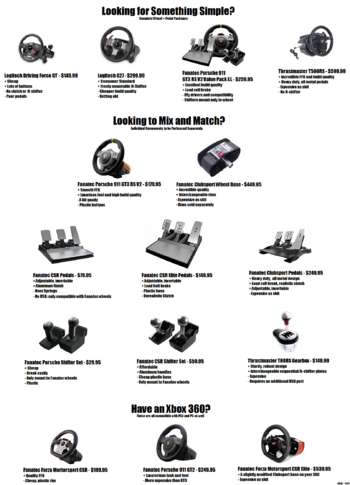 All of Thrustmaster's accessories are compatible with both bases. All of the above-mentioned wheels are compatible with PCs. The only one to avoid if you're buying exclusively for the PC is the G920: the G29 has more buttons and no additional drawbacks (unless you really don't like the Playstation logo). The table below still largely holds true for the PC, though some products are no longer available. This page was last modified on 7 March 2016, at 03:05.